In one brief phone conversation, we'll help you select a house plan concept, and we'll even prepare a no-obligation FREE Cost Estimate tailored to the area where you intend to build your new home. Learn more about how you can get started today. Whether you're just beginning to look at alternatives, or are ready to buy a new home, we encourage you to visit our factory and model complex. We're located only 10 miles from Winston-Salem, North Carolina. Early Topsider Homes were some of the very first prefabricated "kit" homes sold in America. They included nearly everything for the do-it-yourselfer, or small contractor-built getaway in the mountains. Early era Topsider Homes featured a much more "woodsy" look than today, with rough textured wood interior surfaces throughout, ideally suited for cabins. It was obvious from the beginning, however, that Topsider Homes' unique pedestal design was equally well suited for beach and coastal settings. 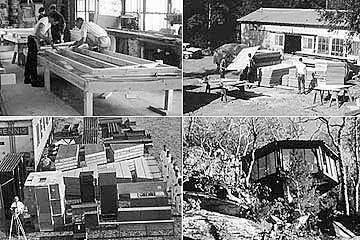 In the 1970s the company grew and moved from Boone, NC to new manufacturing facilities in Yadkinville, NC. During that time frame and into the 1980s, Topsider Homes' business focused principally on resort development projects at such places as Walt Disney World, Pinehurst Country Club, Hilton Head Island and many other well-known resort locations worldwide. Topsider Homes' Main Office and Manufacturing Center in Clemmons, NC. Topsider Homes' modern facilities and 15-acre campus have hundreds of thousands of square feet under roof, with five modern office, manufacturing and warehouse buildings. There are also models on-site and in the immediate area. Our indoor manufacturing facility enables work to continue year-round. The emergence of new architectural and computer aided drafting and design (CADD) technologies in the 1990s permitted Topsider to shift its focus to individual home buyers and one-of-a-kind custom designed structures, built with its unique and proprietary post and beam and panelized component building system. It was in this era that Topsider Homes constructed the first of six buildings at its new campus-style facility in suburban Clemmons, North Carolina, near Winston-Salem. Topsider Homes has sold thousands of homes worldwide ranging in size from small prefab cabins and cottages to unique custom post and beam home designs approaching 20,000 sq. ft. We have even produced prefabricated and panelized restaurants and other commercial buildings. As times change Topsider's business also continues to change and evolve. Today, new home building materials and technologies are becoming available at a rapid pace, and we constantly strive to improve our building system and to keep up-to-date with these new opportunities that add value to our homes and services. As Topsider Homes has grown from the maker of a small rustic house "kit" in 1968 into a leading custom home design and prefabrication firm, selling worldwide, our roots have remained where they started - unique designs, superior quality materials and craftsmanship, and an unmatched commitment to service. These buildings house Topsider's Architechtual Design Department, Interior Design Center Showroom and Client Services Department.